N 43° 42' 30" and E 10° 24' 12"
Pisa in Province of Pisa (Tuscany) with it's 77,007 habitants is a city located in Italy about 165 mi (or 265 km) north-west of Rome, the country's capital town. Current time in Pisa is now 11:40 AM (Sunday). The local timezone is named Europe / Rome with an UTC offset of 2 hours. We know of 12 airports closer to Pisa, of which 5 are larger airports. The closest airport in Italy is Pisa / San Giusto - Galileo Galilei International Airport in a distance of 2 mi (or 3 km), South. Besides the airports, there are other travel options available (check left side). There are several Unesco world heritage sites nearby. The closest heritage site in Italy is Piazza del Duomo, Pisa in a distance of 1 mi (or 2 km), North. We saw 5 points of interest near this location. In need of a room? We compiled a list of available hotels close to the map centre further down the page. Since you are here already, you might want to pay a visit to some of the following locations: San Giuliano Terme, Vecchiano-Nodica, Calci, Collesalvetti and Cascina. To further explore this place, just scroll down and browse the available info. Let's start with some photos from the area. 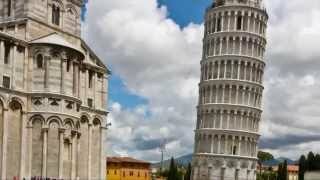 Video promozionale realizzato con il contributo di Toscana Promozione, Comune di Pisa e Camera di Commercio di Pisa nell'ambito del Progetto AD2014 - Pisa Tower in San Francisco Attori: Cristina. Simulazione di doppio a 4 campane. 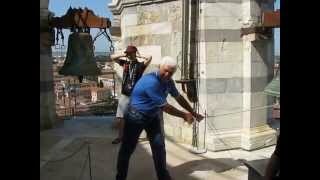 Chiaramente sulla Torre di Pisa è impossibile suonare "a slancio" da svariati decenni. Semifinale playoff all'arena garibaldi di Pisa tra Pisa e Perugia, valevole per un posto in finale per l'accesso al campionato di serie bwin del prossimo anno. 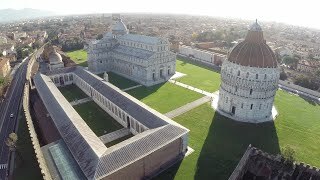 Film despre Pisa: turnul din Pisa, Fluviul Arno, Piazza dei Miracoli, Battistero. Flm Full HD. There's more to Pisa than it's famous Leaning Tower. 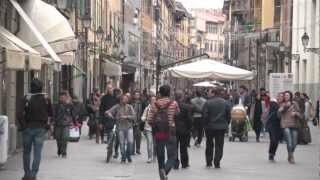 Join Euromaxx for a tour of this lively Tuscan city. Read more: http://www.dw.de/program/euromaxx/s-7555-9798. The University of Pisa (Italian Università di Pisa), is an Italian public research university located in Pisa, Italy. It was founded in 1343 by an edict of Pope Clement VI and is the 19th oldest extant university in the world and the 10th oldest in the country. The university is considered very prestigious and is currently ranked between 1st and 3rd places nationally, in the top 30 in Europe and top 300 in the world. Located at 43.7165, 10.3985 (Lat. / Lng. ), about 1 miles away. The Province of Pisa (Italian: Provincia di Pisa) is a province in the Tuscany region of Italy. Its capital is the city of Pisa. It has an area of 2,448 km², and a total population of 420,554 (2012). 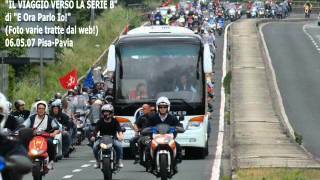 There are 39 comuni in the province http://www. upinet. it/indicatore. asp?id_statistiche=6. Pisa is well known for the famous Leaning Tower of Pisa, which is located in the city. It brings much tourism to this area. Located at 43.7167, 10.4 (Lat. / Lng. ), about 1 miles away. Santa Maria della Spina is a small Gothic church in the Italian city of Pisa. The church, erected in 1230, was originally known as Santa Maria di Pontenovo: the new name of Spina ("thorn") derives from the presence of a thorn allegedly part of the crown dressed by Christ on the Cross, brought here in 1333. In 1871 the church was dismantled and rebuilt on a higher level due to dangerous inflitration of water from the Arno river: the church was slightly altered in the process, however. Located at 43.7153, 10.3964 (Lat. / Lng. ), about 1 miles away. San Frediano is a church in Pisa, Tuscany, Italy. Its existence is mentioned as early as 1061. Founded by the family Buzzaccherini-Sismondi and originally dedicated to Saint Martin, it had once an hospital annexed to it. The Romanesque façade shows typical features of the Pisane medieval architecture, such as the blind arcades, the lozenges and the use of bichrome stones (present also in the city's cathedral). In the upper part is a large mullioned window. Located at 43.718, 10.3994 (Lat. / Lng. ), about 1 miles away. San Paolo a Ripa d'Arno (St. Paul on Arno's bank) is a church in Pisa, Tuscany, Italy. It is one of the most outstanding Romanesque churches in Tuscany. The church is also locally known as Duomo vecchio (old cathedral). Located at 43.7128, 10.3935 (Lat. / Lng. ), about 1 miles away. Located at 43.7166, 10.3967 (Lat. / Lng. ), about 1 miles away. The Palazzo delle Vedove (Italian for Widows' Palace) is a palace in Pisa, Tuscany, Italy. The palace, built in the 12th–14th centuries, is sited land which in antique times was the domus of the Bocci family of Pisa. Detail of the medieval edifice can still be seen in the exterior, including a marble quadruple mullioned window partially covered by a rectangular window. On one of the side was once a portico. Located at 43.7166, 10.396 (Lat. / Lng. ), about 1 miles away. San Francesco de' Ferri is a church in Pisa, Tuscany, Italy. Mentioned for the first time in a document from 1233, the church was rebuilt starting from 1261 by will of archbishop Federico Visconti. The church was under the patronage of the Pisane noble families, who owned a series of private chapels for their burials; the Franciscan were limited to the administration of the cult. The works, directed by Giovanni di Simone, ended in 1270 and included also the slender bell tower. Located at 43.7183, 10.4064 (Lat. / Lng. ), about 1 miles away. San Paolo all'Orto is a church in Pisa, Tuscany, Italy. Documented from 1086, it was a priory from the 12th to the 15th centuries, held by Augustinian nuns. The church is now unconsecrated and used for cultural events. The façade has the typical Pisane stripes of bichrome marble stones, and is articulated in five arcades with lozenges, intarsias and capitals sculpted by Biduino (late 12th century). The bell tower, which was rebuilt several times, dates to the 17th century. Located at 43.7175, 10.4042 (Lat. / Lng. ), about 1 miles away. San Pietro in Vinculis is a church in Pisa, Tuscany, Italy. It was built by the Augustinians in 1072-1118 over a pre-existing edifice. The rectory was added a few years later. The structure follows the Pisane Romanesque style established by Buscheto. It has a nave and two aisles with apses. The façade is articulated by pilaster strips, blind arches, oculi (small circular windows), lozenges and mullioned windows. Located at 43.7162, 10.4035 (Lat. / Lng. ), about 1 miles away. San Michele in Borgo is a church in Pisa, Tuscany, Italy. The church, together with monastery (which first belonged to the Benedictines, and, from the 12th century, the Camaldolese) was built in the late 10th to early 11th century outside the walls of the city, over an ancient temple dedicated to Mars. Both were restored several times in the following ages. The façade is from the 14th century. The upper part has three order of typically Pisane Gothic loggias. Located at 43.7169, 10.4025 (Lat. / Lng. ), about 1 miles away. The Church of the Santo Sepolcro is a religious edifice in Pisa, Tuscany, Italy. Built in the early 12th century (it is known at least from 1113), it was designed by Diotisalvi, who also designed the Baptistery of Pisa Cathedral forty years later. It has an octagonal plan and, until the 16th century, it was surrounded by a portico. The central tambour, supported by eight ogival arches, is super-elevated and is surmounted by a conic cusp. Located at 43.7145, 10.4033 (Lat. / Lng. ), about 0 miles away. The statue of Cosimo I de' Medici stands in the middle of Knights' Square of Pisa, just in front of Palazzo della Carovana. It was commissioned by Grand Duke Ferdinando I in 1596 to the Franco-Flemish sculptor Pietro Francavilla, who executed it in the elegant Late Mannerist tradition. The statue celebrates Ferdinando's father as the first Grand Master of the Order of the Knights of St. Stephen and is a civic symbol of the hegemony of Florence. Located at 43.7195, 10.4002 (Lat. / Lng. ), about 1 miles away. Pisa Centrale railway station (Italian: Stazione di Pisa Centrale) is the central station of the Italian city of Pisa. The station is one of the major railway junctions of Tuscany. Lines serving the station include three long-distance lines: the Pisa–Livorno–Rome line, the Pisa–La Spezia–Genoa line and the Pisa–Florence line. Local services operate on the Lucca–Pisa line and the Pisa–Pisa Airport line. Located at 43.7083, 10.3983 (Lat. / Lng. ), about 0 miles away. Pisa Aeroporto railway station (Italian: Stazione di Pisa Aeroporto) is sited within the Galileo Galilei Airport in Pisa, Tuscany, Italy. The airport is also known as Pisa-San Giusto Airport, due to its location in Pisa's San Giusto district. Located at 43.6983, 10.3983 (Lat. / Lng. ), about 1 miles away. San Silvestro is a former church in Pisa, Italy, facing piazza San Silvestro. It is now deconsecrated. Located at 43.7142, 10.4098 (Lat. / Lng. ), about 0 miles away. Sant'Antonio Abate is an ancient church in Pisa, Italy facing the Piazza Sant'Antonio. It was founded in 1341 with an adjacent convent. It was nearly destroyed after World War Two, and was rebuilt. The inferior façade, in two colors of marble, was the design product of Lupo, Giovanni di Gante, and Simone di Matteo of Siena. The vast 1989 mural of Tuttomondo by Keith Haring, was one of the last public works of the graffiti artist. \t\t \t\t\tSant'Antonio Abate, Pisa, facciata. Located at 43.7111, 10.3975 (Lat. / Lng. ), about 0 miles away. Santo Stefano dei Cavalieri is a church in central Pisa located on Piazza dei Cavalieri (Knight's Square). Construction began on April 17, 1565 in order to build a church for the Order of Knights of St Stephan, founded by the Grand Duke Cosimo de' Medici to fight Saracen piracy in the Mediterranean. Located at 43.7193, 10.401 (Lat. / Lng. ), about 1 miles away. The Madonna dei Galletti is a church in Pisa, Italy. Documents from 1227 mention a church at the site called San Salvatore in Porta Aurea; the latter is one of the gates of the walls of medieval Pisa. The church underwent reconstruction in the 16th century. The façade was added in 1757 on designs of Ignazio Pellegrini. The gilded wooden ceiling from 1642 has been attributed to Del Norcia, and the canvases therein to Jacopo Vignali, Cecco Bravo, Lorenzo Lippi, and Francesco Curradi. Located at 43.7167, 10.3994 (Lat. / Lng. ), about 1 miles away. San Donnino is a church in Pisa, Italy. A church was known at the site since 1242, and construction of the present structure began in 1303. It was adjacent to a Benedictine Monastery. In 1575, Cardinal Ferdinando de' Medici conceded the monastery to the Capuchin. Gravely damaged during World War II, it was restored until. The interior contains frescoes of the Madonna and child and a wooden crucifix, both from the 14th century. Located at 43.707, 10.3977 (Lat. / Lng. ), about 0 miles away. Santa Maria del Carmine is a church in Pisa, Italy. The church was originally built for the Carmelite order in 1324-1328. By 1425, it was decorated with a famed, now dispersed, polyptich by Masaccio . Only one table of the altar remains in Pisa in the National Museum of San Matteo. The church itself underwent many reconstructions across the centuries. The present simple façade was designed by Alessandro Gherardesca, in the 1830s. Located at 43.7128, 10.4004 (Lat. / Lng. ), about 0 miles away. San Martino is a church in Pisa, Italy, facing piazza San Martino, on the left bank of the Arno river. Documents from 1067 cite a church of "San Martino in Guazzolongo" (name of the quartiere), belonging to the Augustinian order. It was rebuilt in 1331, under the commission of Bonifacio Novello della Gherardesca, who wished to endow a convent a nuns of an Order of Saint Clare. From 1395, it was considered "cappella del Santissimo Sacramento". Located at 43.7128, 10.4044 (Lat. / Lng. ), about 0 miles away. Sant'Andrea Forisportam is a church building, now deconsecrated, in Pisa, Tuscany, Italy. A church on the site is documented as early as 1104, the name deriving from its location outside a gate of the walls of medieval Pisa. The church served as a parish church until 1839, under the jurisdiction of the church of San Pietro in Vinculis. In that year, it was deconsecrated and used as a fish-market. Located at 43.7162, 10.4056 (Lat. / Lng. ), about 1 miles away. Santa Corona is a medieval church located in Vicenza, and contains the Valmarana chapel (circa 1576), whose design is attributed to the architect Andrea Palladio. Palladio himself is buried in this church. The church was founded by the blessed Bishop Bartolomeo di Breganze, during the 1200s to house a thorn from the supposed relic of the crown (corona) of thorns forced on Jesus during his passion. The thorn was given to this bishop as a gift from Louis IX of France. Santi Jacopo e Filippo or Santi Iacopo e Filippo (or San Iacopo in Orticaia) is an ancient church found in Via San Michele degli Scalzi in Pisa, Italy. Documents exist as belonging to an Augustinian abbey by 1110. The Romanesque architecture includes a half-finished facade. Restored in the 17th and 18th century, the interior was frescoed by Francesco and his brother Giuseppe Melani with stories of the saints. Located at 43.7088, 10.4145 (Lat. / Lng. ), about 1 miles away. These are some bigger and more relevant cities in the wider vivinity of Pisa.